When I dress my kids this summer, I plan to adopt a “one and done” philosophy. Rather than layering them up in t-shirts and shorts and tanks, I want to reach for one garment and go… And this Summer Romper for Kids is the garment I am going to grab! These Rompers are simple to make, fun to wear and so perfectly chic, I can’t imagine wanting to add anything else to the mix. 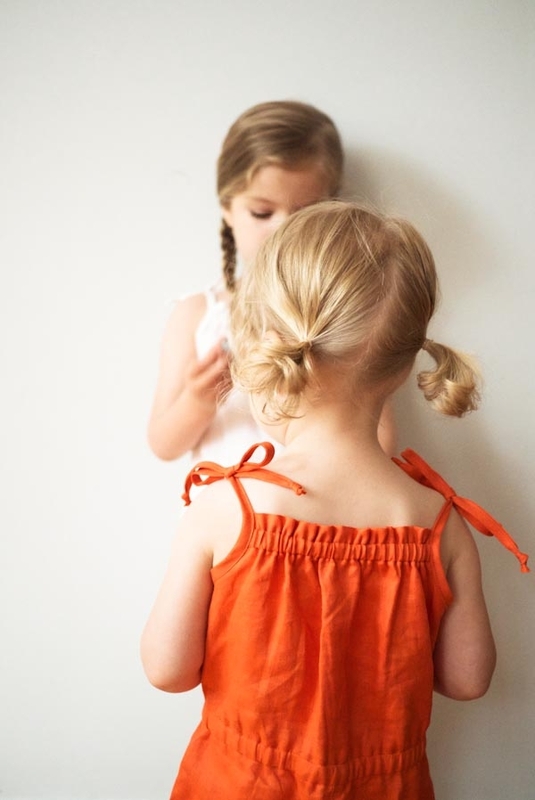 Plus, the free pattern is available in seven sizes, from 2 to 11 years, and features adjustable straps and an elastic waist for a forgiving fit. I think I may have found the solution to the morning get-dressed battle, but I may have created a new bedtime take-it-off fight! Fine, sleep in it, too. After all, this is the summer of the Romper! 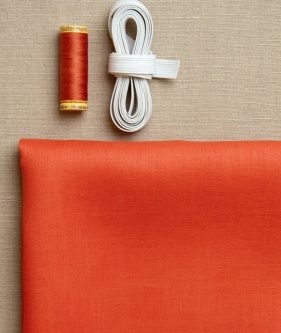 A 110-yard spool of Gutermann’s Cotton Sewing Thread in a color to match the fabric. We used, from left to right, color 1040, 1040 and 4850. Finished Waist Sizes: 22 (23, 23 ½, 25, 26, 27, 27 ½) inches in circumference, unstretched. Prewash all fabric before starting. Use ¼-inch seam allowances, unless otherwise noted. The two Bottom Front pieces and two Bottom Back pieces should be mirror images of each other. To be sure to cut them with the proper orientation, cut one with the right side of the fabric facing up and one with the wrong side of the fabric facing up, or you can fold the fabric and cut through both layers at once. You may need to piece the strips to get the appropriate length. For detailed instructions on how to piece binding strips, please visit our Making Single Fold Bias Tape Binding Tutorial. 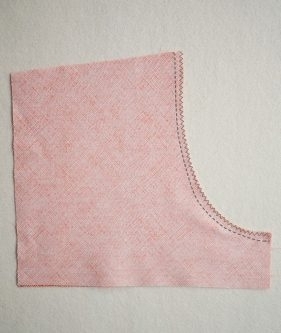 Cut two 6 (6 ¼, 6 ½, 7 ¼, 8 ¼, 8 ¾, 9)–inch pieces for the Neckline Elastic. Cut one 22 ½ (23 ½, 24, 25 ½, 26 ½, 27 ½, 28)–inch pieces for the Waist Elastic. Following the manufacturer’s instructions, use the 18mm Bias Tape Maker to press the Waistband and Strap strips into single fold binding. 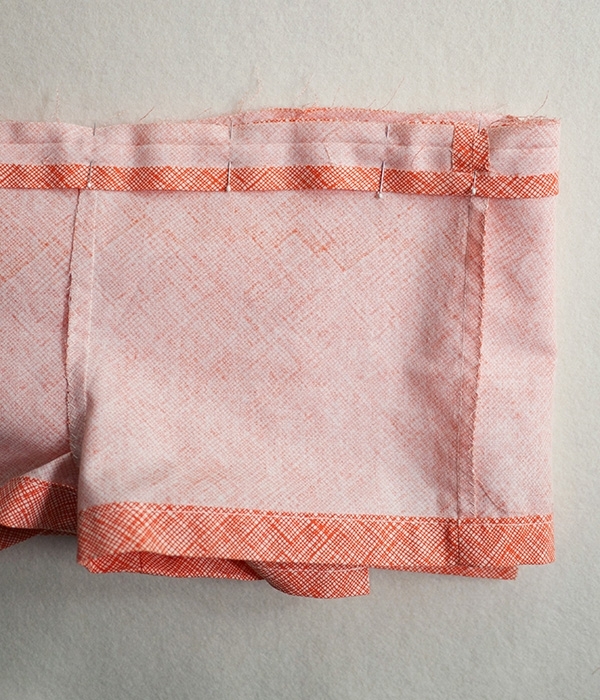 Open up the folds at the two short ends of the Waistband piece. With rights sides together, stack the two ends on top of each other and pin in place. 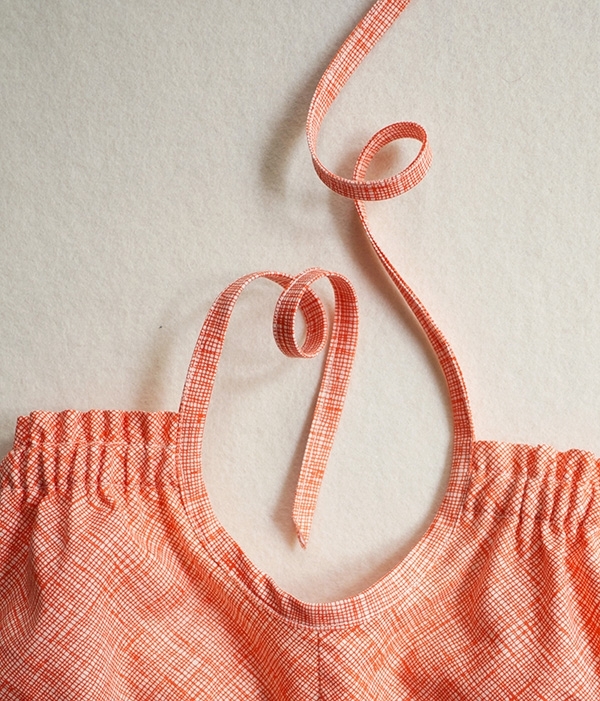 Sew along the short, pinned edge to create a Waistband loop. Press the seam open and refold the creases. With right sides facing, stack the two Bottom Front pieces on top of each other. Pin along the concave edge of the inseam. Repeat with the two Bottom Back pieces. Place a pin in the Bottom Back to help distinguish between the Bottom Front and Back. With right sides facing, match up the short crotch ends of the Bottom Front and Back along the raw edge, making sure that the center seams line up. Pin in place and sew along the pinned edge. Lay the Bottom pieces so that the right sides of the Front and Back are together and their straight side seams align. Pin together along the raw edges of the side seams. Sew along the pinned edges. 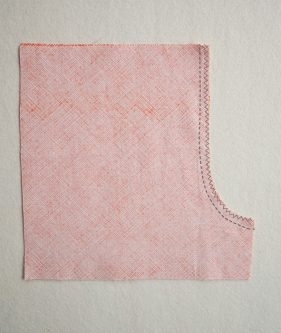 Sew along the seam allowance with a zigzag stitch. Press the seam to one side. This is now the Bottom. 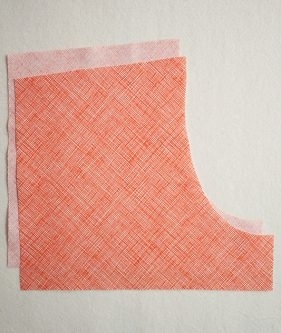 Fold the bottom raw edge of one leg opening ¼ inch towards the wrong side and press. Now, fold the edge ¾ inch toward the wrong side and press again. Pin in place. Sew the hem down with an edgestitch. Repeat for the bottom raw edge of the other leg opening. With right sides facing, stack the two Top pieces. Pin along the two side seams. Sew along the pinned edges. 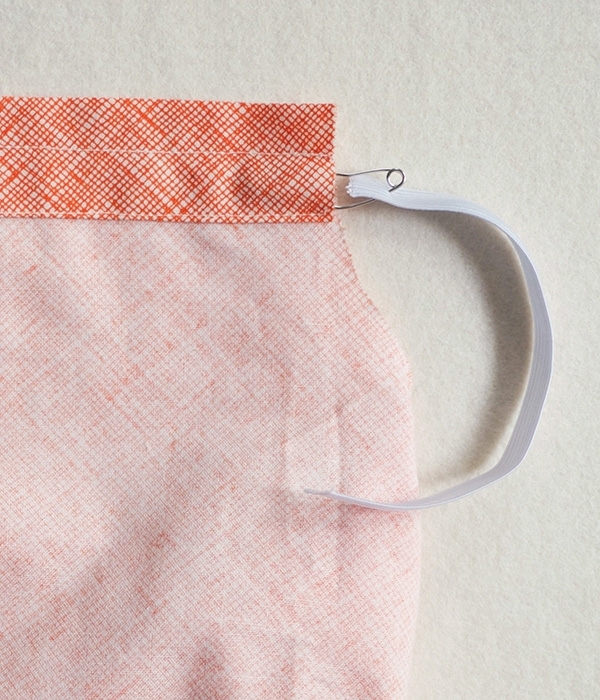 Sew along the seam allowances with a zigzag stitch. Press the seams to one side. This is now the Top. 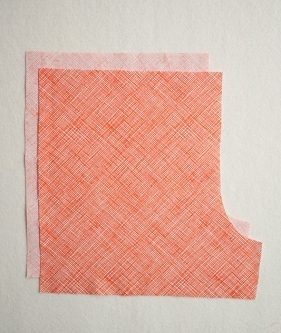 Fold the top edge of one side of the Top ¾ inch towards the wrong side and press. Fold this edge 1 1/8 inch toward the wrong side and press again. Pin in place. Repeat for the top edge on the other side of the Top. Turn the Bottom so that its wrong side is facing out. Turn the Top so that its right side is facing out. Slip the Top inside the Bottom, right sides together. Make sure the back of the Top faces the back of the Bottom. Align the top raw edge of the Bottom with the bottom raw edge of the Top and match up the side seams. Pin in place along the raw edges. 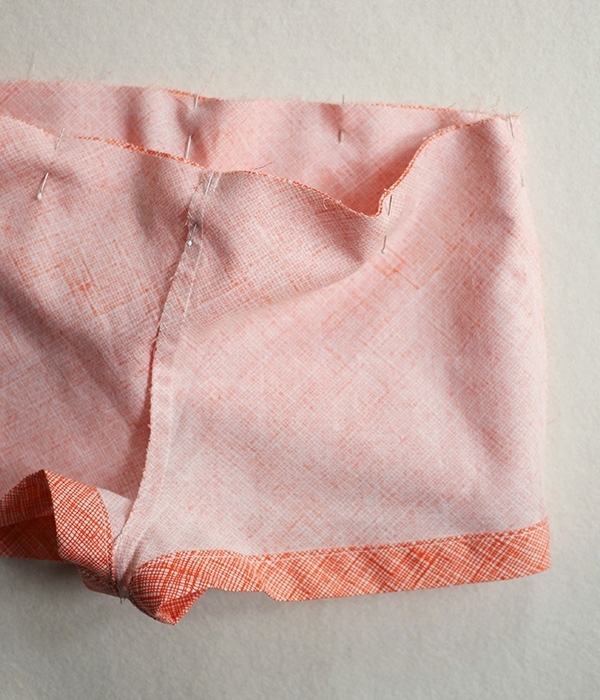 Next, open up one fold of the prepared Waistband piece. With the right side of the Waistband facing the wrong side of the Bottom, line up its open raw edge with the pinned edges of the Top and Bottom, making sure to align the Waistband seam with one side seam of the Bottom. Pin all three layers together along the raw edges. 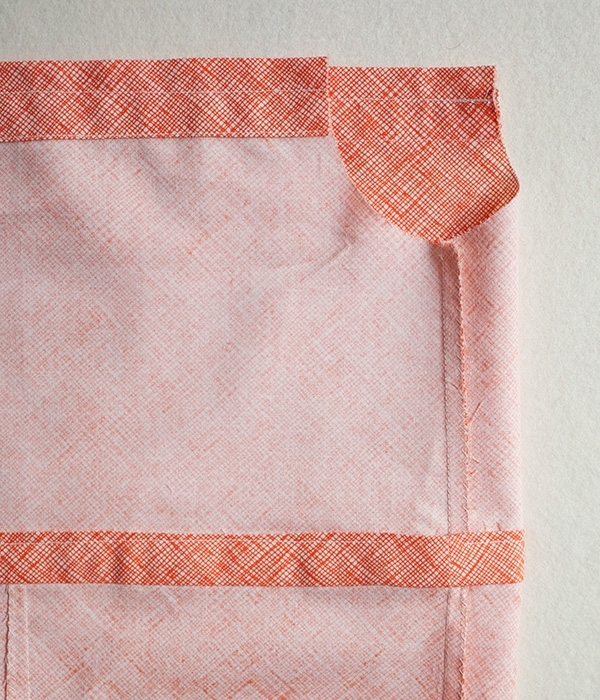 Sew the three layers together along the pinned edge with a ¼-inch seam allowance, using the crease in the Waistband as a guide. 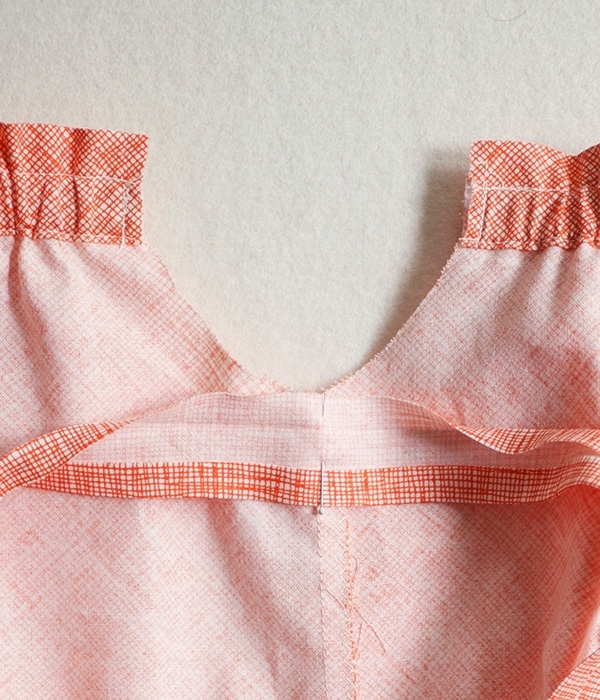 Unfold the Romper so the Top is no longer tucked inside the Bottom and the wrong side is facing out. 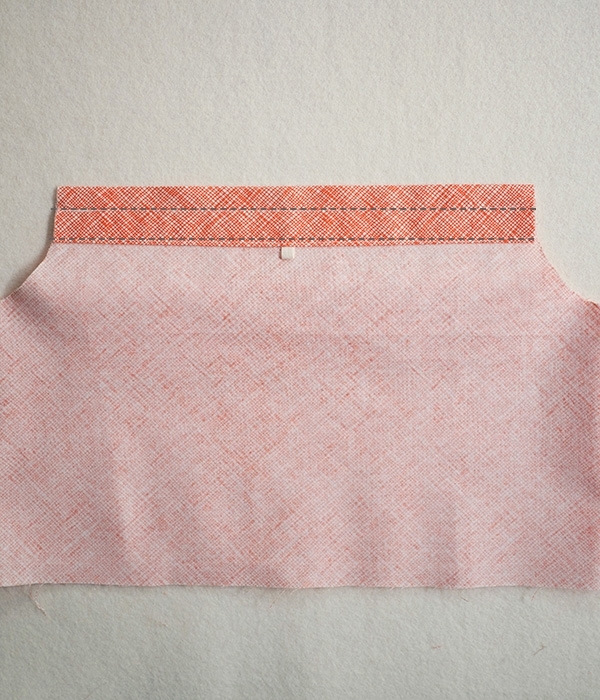 Press the Top and Waistband up, along the seam line. Edgestitch the top folded edge of the Waistband to the Top, leaving a 1-inch gap in the seam. Attach the safety pin to one end of the Waist Elastic. Insert this end into the gap. Pull the pin through the Waistband, exiting out the other side. Make sure to not pull the Elastic’s other end into the channel. 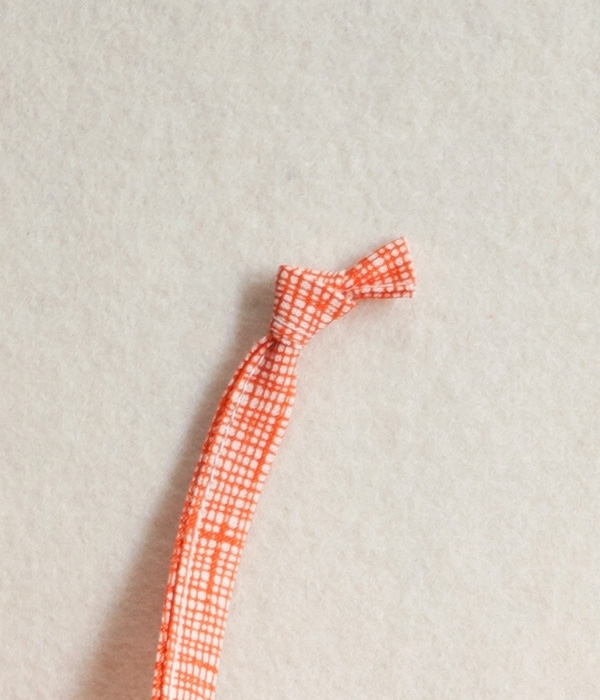 Checking that the Elastic isn’t twisted, overlap the two ends by ½ inch. 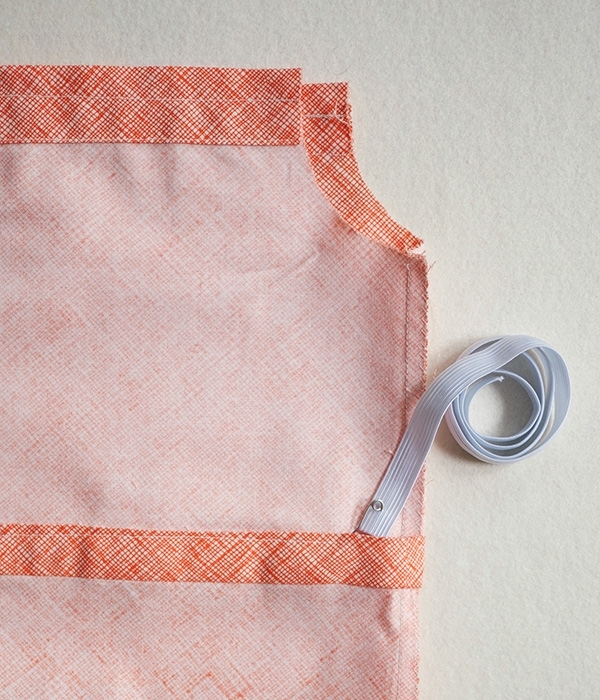 Sew the ends together widthwise with a zigzag stitch. 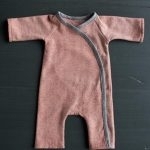 Attach the safety pin to one end of one piece of the Neckline Elastic. Insert this end into the channel at one top edge of the Top. Slowly pull the pin through the channel, stopping right before the other end of the Elastic is pulled into the channel. Tack this end of the Elastic here, right at the edge of the channel, by sewing a short edgestitch along the raw edge of the Top, sewing through the Elastic and all layers of the channel. Continue to pull the elastic through until you have pulled the pin out on the other side. 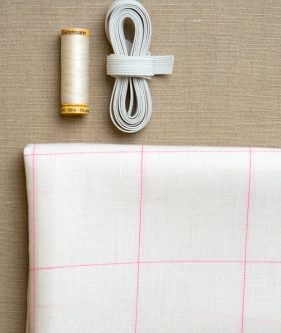 Sew the other end of the Elastic to this side of the channel in the same way as described above, making a short edgestitch through all layers. Lay out the Romper with the wrong side facing out. Fold one Strap piece in half to mark its center. Open up one fold of the Strap piece. 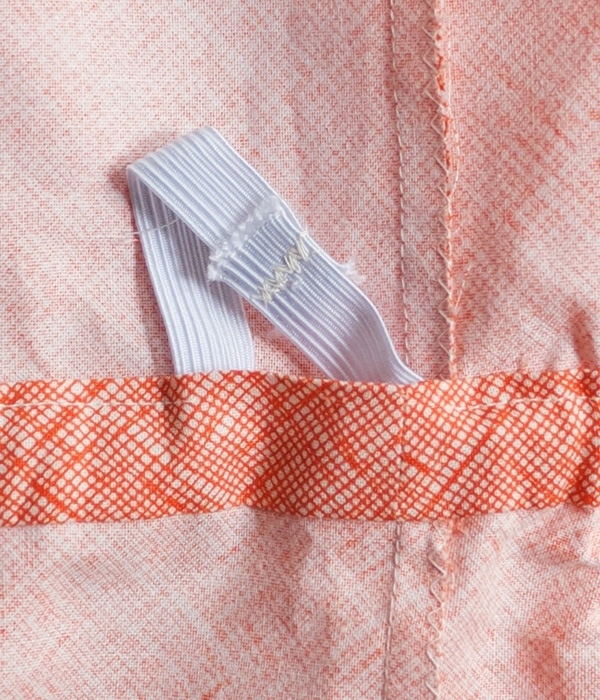 With the right side of the Strap facing the wrong side of the Romper, match up the center of the Strap with the side seam of the Top, aligning their raw edges. Pin in place. Working in one direction and then the other, continue to pin the open edge of the Strap to the armhole until you reach the top folded edge of the Top. 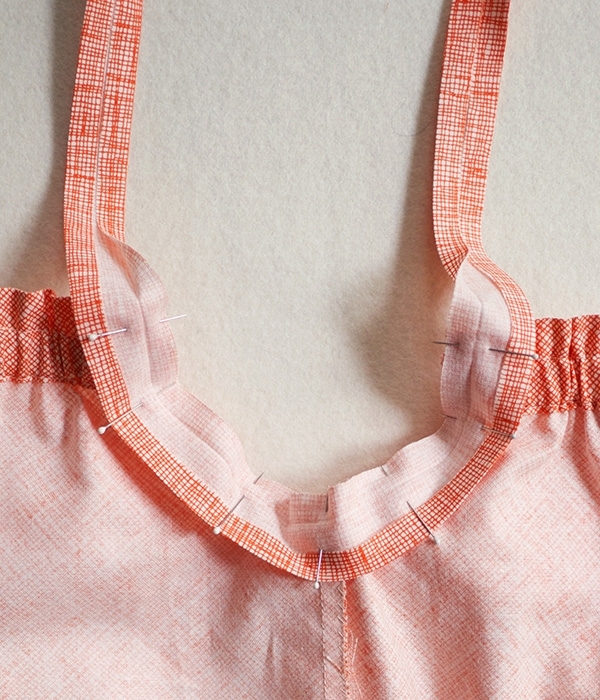 You will have an overhang of bias tape at each end of the armhole, which will be the straps. 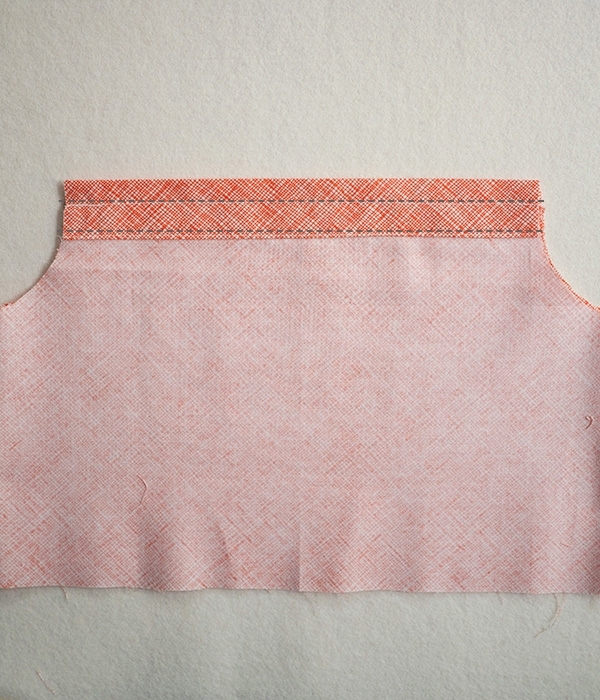 Sew the bias tape to the garment along the armhole edge with a ¼-inch seam allowance, using the fold of the tape as a guide. 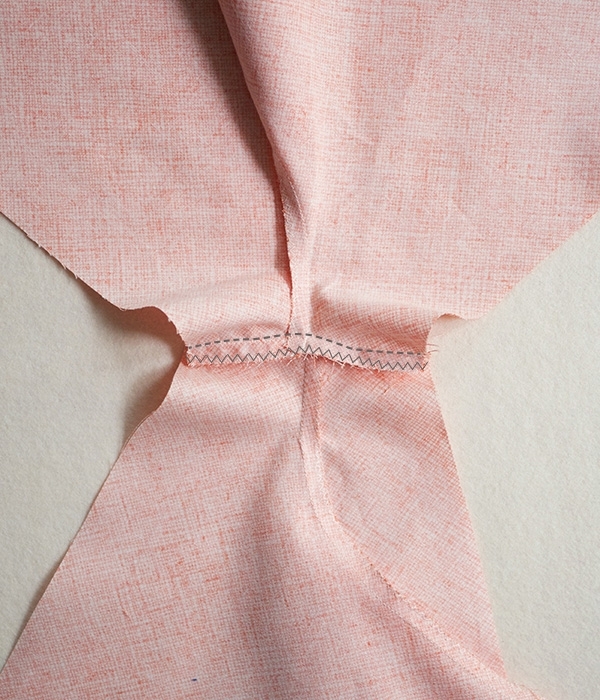 Fold the bias tape towards the Top’s right side and press flat. 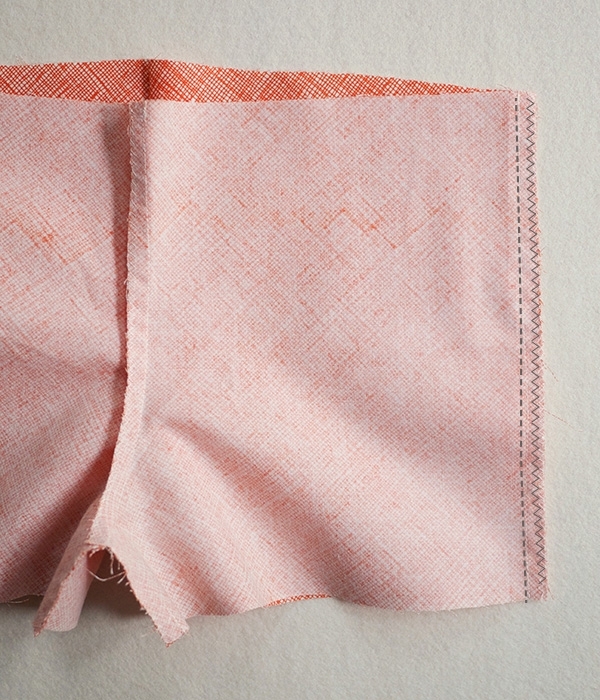 The long, raw edges of the bias tape, as well as the raw armhole edge, will be enclosed in the fold. 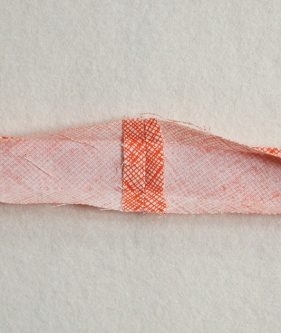 Sew along the entire length of the tape along the open edge, being careful to catch both sides as you sew. Repeat with the other Strap piece on the other armhole edge. 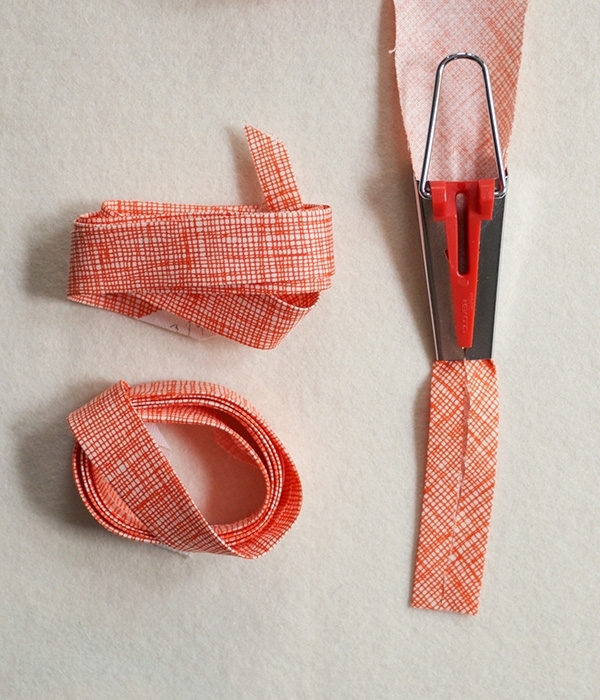 At the end of each Strap, tie the bias tape in an overhand knot and trim the end. Note: You can easily trim the Straps to any length. 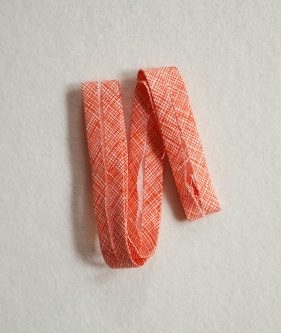 Simply cut the bias tape down and retie the knot. The Romper is ready to wear! THANK YOU! This is exactly the kind of romper I’ve been looking for. The tutorial looks fantastic. I can’t wait to make a few. Loved this pattern; however in 2 t needed a little more room for diaper in shorts area. Where can I get the bias press? Thank you for this pattern very clear and easy to use. Even for a french girl ! My daughter loves this romper and she asked me for a second one. What a cute pattern. Going to make a bunch for kids living in shelters, especially in these hot areas. I really like this one. Thanks much! You are welcome, so happy that you like this, it is one of my personal favorites. This pattern is truly adorable, the kids will love them. It is very beautiful,and kind what you are doing. Thanks for writing in! Unfortunately, we are unable to provide a sized down pattern at present be we will keep your request in mind for the future! Thank you so much for this super quick and easy pattern, Wish I had found it before now! 2 hours from printing to finish- great. I can see this becoming a regular ‘go to’ for summer in the future. Thank you for your for these lovely words. We are happy to hear it! 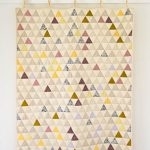 Can I make this with purchased single fold bias tape? The single fold bias tape, might be slightly narrow, it should be ok, it is just when it goes around the curve of the armhole it might be a little small. Do you have this in adult sizes? Thank you for writing in! The largest size that we have for this pattern is age 11. I will certainly pass your request on! hi! i love this jumpsuit! working on the pattern as i write 🙂 just wondering , is the seam allowance included in the pattern? many thanks!! Yes the seam allowance is included. Love the pattern. Just finished 2 for my granddaughters 7&2 years old. I’ll send a picture. Cute pattern! Wondering if I can make it with a knit fabric? 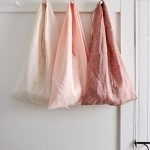 A knit fabric would work beautifully! Thank you so much. I love the pattern. I already made one for my daughter. Thankyou so much for this pattern! So quick & easy! Great instructions! 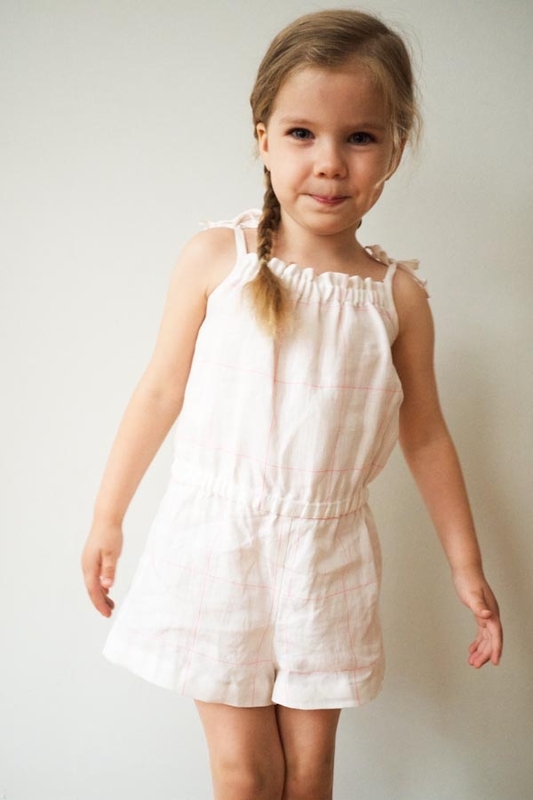 It is hot hot hot in Australia right now and this summer romper is perfect! Thank you for making and sharing the pattern and instructions. 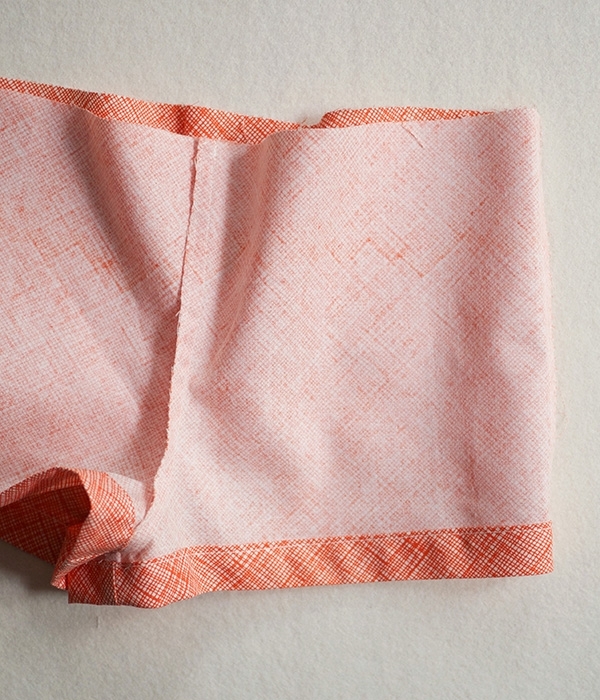 I made one yesterday in linen for my 2 year old and now my older girls want one too – a success! Thanks so much for the pattern. It is just what I was looking for to make for my granddaughter. Where can i find the pattern. I keep looking but cannit find it. Thanks for writing in! 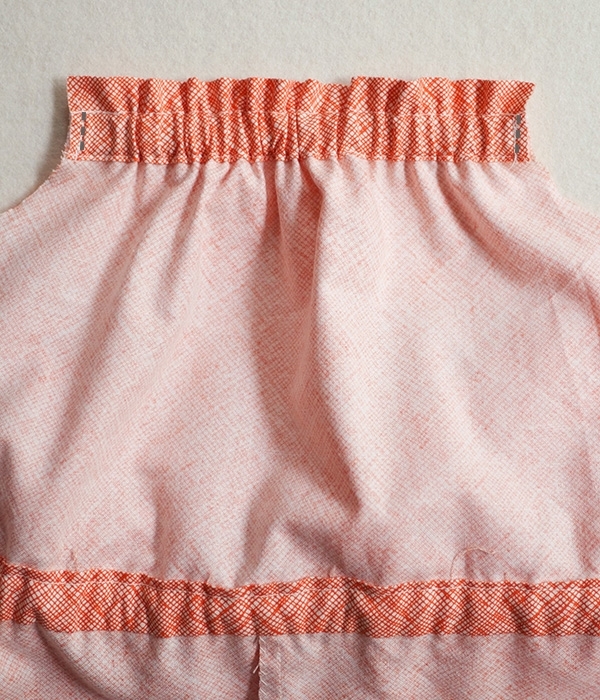 The pattern can be found in the second paragraph of the description of the romper. Thank you so much for this pattern! Is it right that the bottom part is wider than the top part? I’ve printed the pattern, the control square is exactly 1 inch, but there’s on paper a difference of 2 inch between de width of bottom and top. Is that possible? Thank you so much for your kind words! The top and bottom pieces should be a bit different in width as there is an additional seam in the bottom pieces that needs to be accounted for that should make the bottom about an inch larger than the bottom. If you are still having difficulties, please do ensure that you have cut the same sizes for both the bottom and the top. If you are still having difficulties, please let us know and we will do all that we can to help! 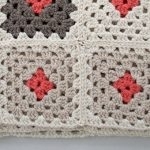 I want this pattern so badly but the link does not give me the pattern pieces. It comes into my computer with the PDF and all the pictures and easy instructions are wonderful BUT no pattern pieces at all? What am I doing wrong. Please help. Thanks for writing in! The pattern download link can be found in the second paragraph of the description of the romper. Thanks for writing in! Happily the pattern does come in sizes 10 and 11, but we will also keep your request for more sizes in mind for the future! In the meantime, I went ahead and e-mailed you a pdf copy of this pattern. Wondering what you would have to do to make it a long pant style? Maybe with an elastic ankle? Great idea! 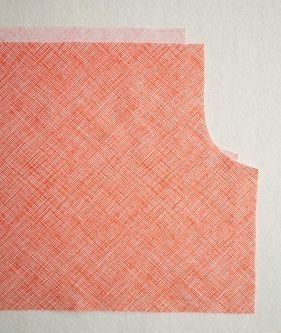 After you have printed and pieced the paper pattern, you can either add more paper or trace onto a larger piece of pattern paper and use a straight ruler to lengthen the bottom as desired. I would taper the leg slightly so there isn’t too much fabric at the ankle, but make sure there is still plenty of ease throughout the leg. You can then insert elastic into the bottom hem. bonjour, serait il possible d’avoir les explication et le patron en Français ? 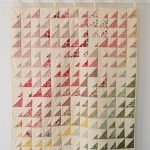 I LOVE this pattern and tutorial. I made one last night and have many more on my to do list for my girls. Thank you! j’adore la couture mais je suis très débutante. Votre combishort me plaît beaucoup mais tout est en anglais …trop compliqué pour moi…….. possible de l’avoir en francais ??? Thank you for reaching out and for your kind words! Unfortunately we do not currently have the resources to translate our patterns, but thank you for your interest and happy sewing! Thank you very much for this pattern and the precise explanations and photos (even for a french woman). I did it in a single day ! Thank you for this pattern, I made a version for my 4 year old daughter. This is likely to be remade every summer until she gets too big for the pattern! Any chance for a teens size? My 13 year old daughter would have loved one! Thank you for reaching outAnd for your kind words- i’m so happy to hear that your daughter is enjoying the finished result so much. Unfortunately we do not have a teen size version of this pattern, but I will certainly pass along your suggestion! I made it in red musslin with a light-pink bias tape. I mixed up the seam allowance and added it at the upper front piece, but it worked out quite well. thank you so much for all those wonderful patterns! such a wonderful romper, thank you so much! I made one with red musslin for my 8yo and it is simply adorable! I love your site so much!whenever you should decide to expand to Europe, I will be your first customer! Thank you for this, one of my favourite patterns. 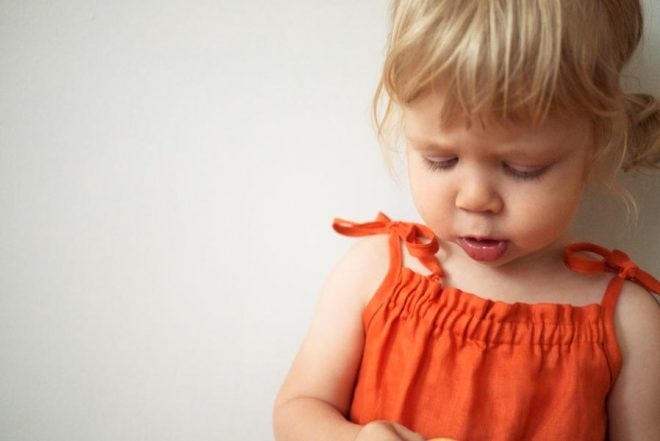 I already made at least 7 outfits from this pattern – several rompers in ages 2-5, but also some adapted styles, e.g splitting the pattern in two halves, and making an opening with snaps at the crutch, for girls in the process of potty training – easier on and off! However, I’m now just in the process of making a front opening all-in-one version without the tie straps, as one of my grand-daughters really hates tie straps. I’ll let you know how it goes. Can you use already made bias tape? If so, what size and kind? TIA! Great question! 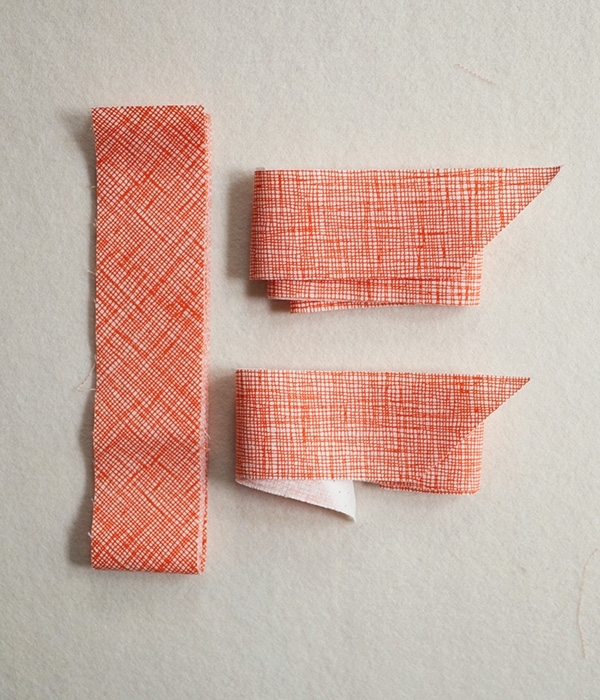 Any bias tape that measures about 3/4″ when flat or 3/8″ when folded will work well – since it is just used for the armhole binding and straps, you have a bit of latitude with the precise width. Our Dot Bias Tape, Neon Bias Tape, or Solid Bias Tape would all be great for this project, and you will need about two yards. 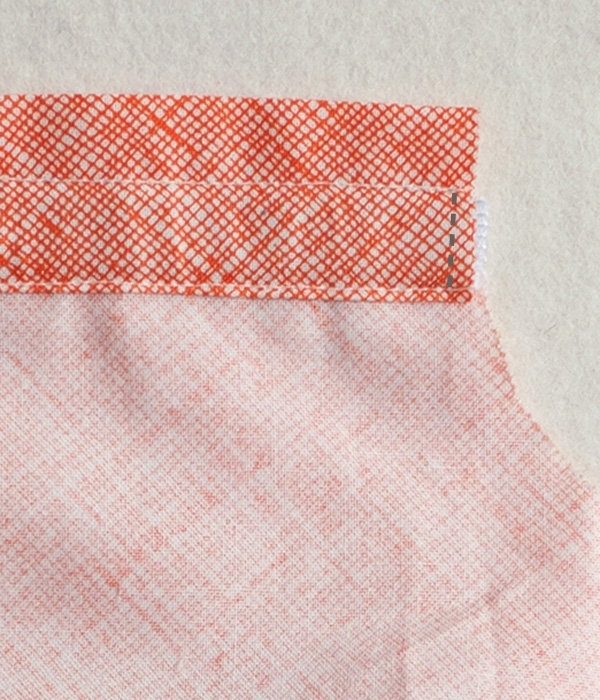 Have you had any success with a serger on this pattern? Thanks for reaching out! 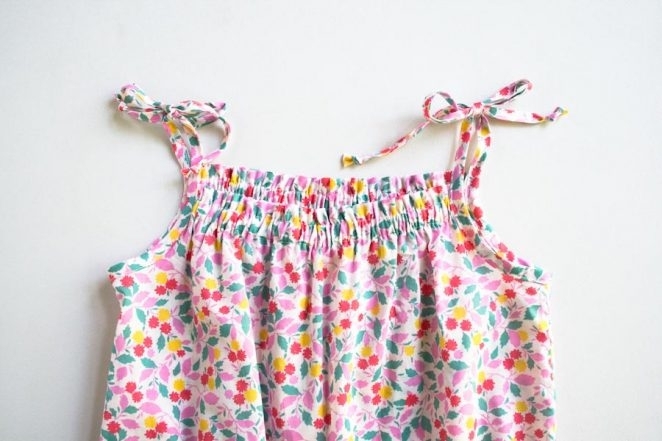 You could certainly use a serger to piece the bottom of the romper as long as you are confident in the construction, as it’s quite difficult to rip out a serged seam! Much of the rest of the romper will have to be sewn with a regular machine to create the elastic casings and hems, but serging the exposed seam allowances would create a lovely finished appearance. 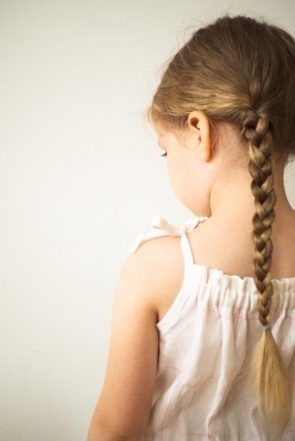 Un grand merci pour le tuto, je galère beaucoup avec les mesures , mais je crois que je vais y arriver et la prochaine fois je mettrais des pressions à entre jambe pour le changement des couches plus pratique pour les parents. Amicalement Murielle. J’ai hâte de passer à la réalisation ! Thanks for reaching out! You are correct that the seam allowances are included in the template. You will use a 1/4 inch seam allowance throughout the pattern, unless otherwise indicated. This will be my first clothing project! I’m more experienced in blankets, pillows, simple things… I came across this for my 20 month old, and I want to try to make it. However, in the instructions for the TOP piece, I’m not sure what it means to “Place on the fold” in the template. Can you please explain?! Also, will I cut the fabric twice for the TOP piece? or does this have to do with “Place on the fold”? Thanks for reaching out! 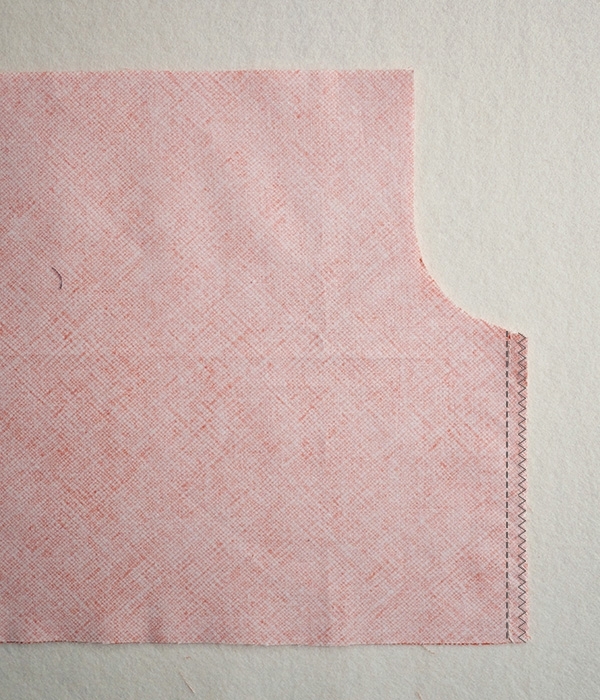 To cut out the top piece, you will need to fold your fabric in half along the grain and then place the pattern piece so that edge marked “Place on the fold” is flush with the fold of the fabric. You will then cut around every side of the pattern piece except this edge, so when you are done, the cut piece will unfold to be the full top piece. I hope that clears things up, and best of luck with your first garment! Love this pattern. 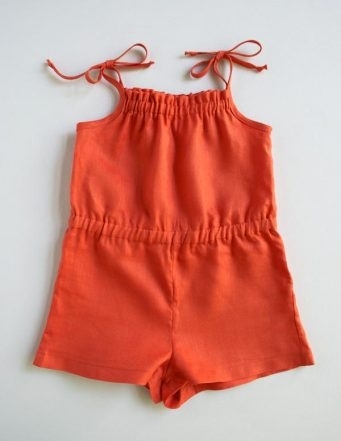 My daughter will be living in these this summer, perfect for South Florida. Can you use knit fabric and are there any adjustments that I would need to make? Thanks so much for the kind words and for writing in! 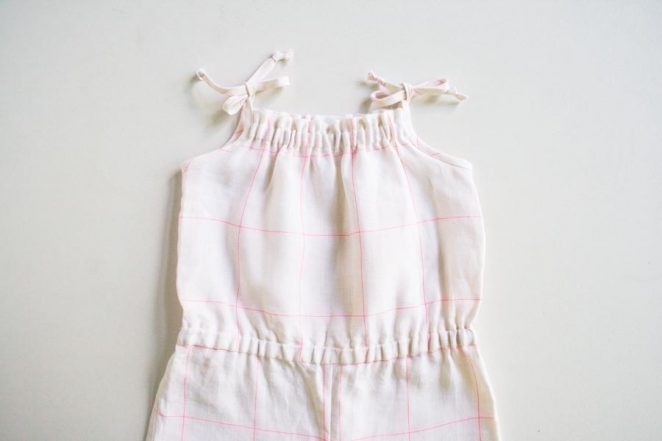 Unfortunately we do not have instructions for sewing this romper with knit fabric; however, if you would like to give it a try, I would suggest sewing a muslin first in an inexpensive knit and sizing down one or two sizes. 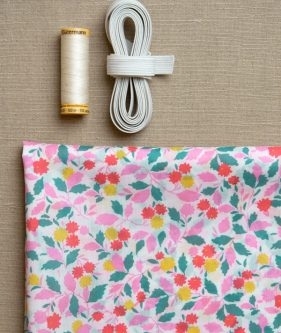 You will also need to use a zig zag stitch or serger for the seams.